The PM PrepCast for CAPM® Elite is Now Available! The PM PrepCast for CAPM® Elite is Now Available! The PM PrepCast for CAPM® Elite gives you the “standout factor” you need to succeed on your exam, and makes the skills, knowledge, tools and techniques required for passing seem like second nature. At last count, over 42,965+ project managers from around the world and from every conceivable industry have used The PM PrepCast to master the knowledge and concepts needed to successfully prepare for their exam. 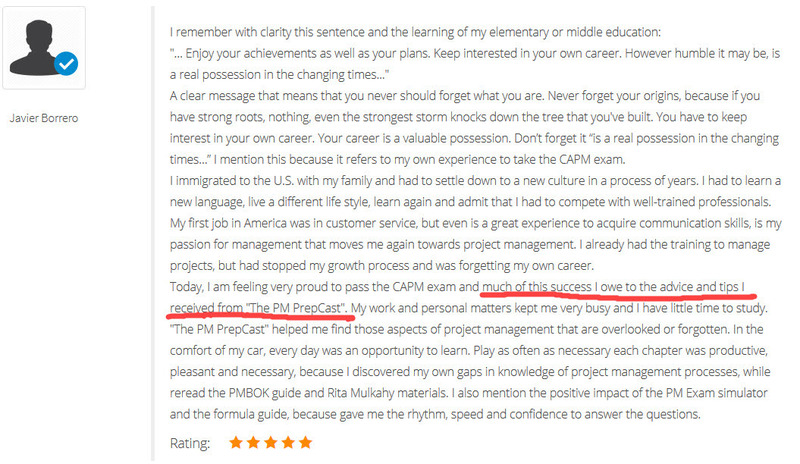 I Owe My CAPM Success To The PM PrepCast!